When people in these parts say they are going to The Gulf, that could mean one of two things. They’re either headed down to splash around in the Gulf of Mexico, or they’re headed for a dining experience to remember. The Gulf Restaurant is located directly on the main beach road, just down the way from Best Western Premier – Tides Hotel. It’s physically striking, built of repurposed shipping containers painted bright blue. Furnishings range from picnic tables to cocoon chairs, driftwood tables to stark white couches. 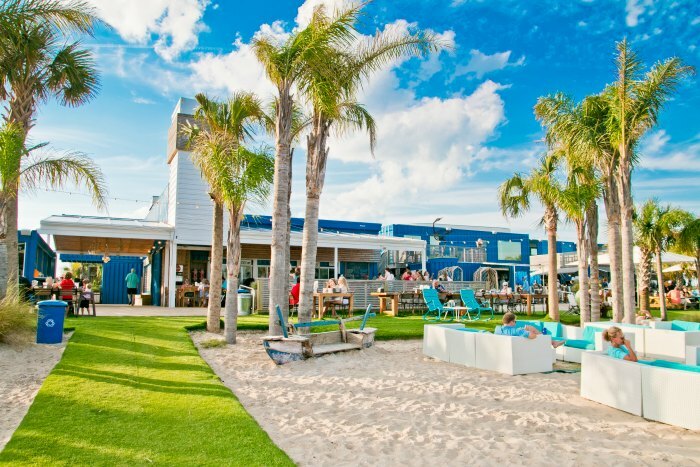 It’s a casual, yet chic atmosphere where twinkle lights are artfully strung between palm trees. Everything is inspired by – you guessed it – the Gulf of Mexico. Which you’re looking at when you eat here, by the way. The menu changes daily but revolves around what’s fresh and what’s in season. There isn’t a surplus of selections, but that’s what makes this place special. Whatever you choose, it’s going to be delicious … just good, simple food handcrafted by people who care. Menu items are handwritten on a chalkboard next to the window where you order. That’s right, you go up to order. So get there, pick your spot (SO MANY SEATING OPTIONS) and hightail it to the food window. They’ll give you a number to place at your table, and your food will be delivered as soon as it’s ready. The Gulf Burger is a staple, made with 100 percent all natural Meyer Ranch Angus Beef. Spread on some garlic aioli and slap it on a brioche bun, and you’ll understand what all the fuss is about. That one’s on the menu every day, along with other favorites like the Fried Grouper Sandwich. Beyond that, you might find specials like Flounder Ceviche or Pickled Shrimp, just depending on that day. Tacos at The Gulf became so popular that the restaurant opened up a little taco bar, where you can always get them – fish, chicken, steak and shrimp. The bar is separate from food service, with a great wine and beer list, as well as artful cocktails. The Bloody Mary is excellent. They also serve all your standard fruity beach drinks, classed up for good measure. The open air, fun vibe is ideal for couples or families, big groups or small. Come for the food, stay for the view. And oh, by the way, they spin vinyl. 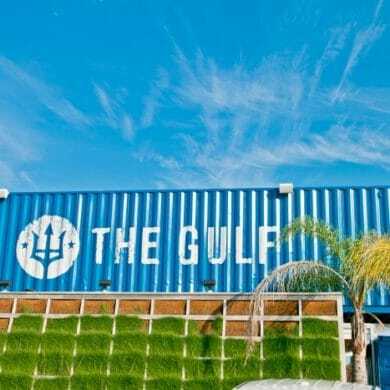 The Gulf is located at 27500 Perdido Beach Boulevard in Orange Beach AL. For more information, please visit The Gulf’s website or call (251) 424-1800.